Traveling around Madhya Pradesh, every state run handicraft emporium shop that you come across is named as Mrignayani. A beautiful lady with emphasis on her eyes can be seen painted on the walls. Mrignayani, meaning the lady with eyes like that of a deer. Having heard about her name many times by now, I was looking for the story behind the lady with beautiful eyes and I found it in the Gwalior fort complex. This is the love story of Raja Man Singh Tomar, the most revered king of Gwalior and his ninth wife Mrignayani. When Raja Man Singh went on a hunting expedition, he comes across a Gujar girl! You might have heard stories of how men tame the buffaloes to impress and marry girls, here the story is the other way round. The Gujar girl was seen handling two buffaloes which were fighting and got their horns tangled. She is seen untangling the horns of two mighty buffaloes and the king is super carried away with her beauty, bravery and valor. He asks her to become her queen and she places three conditions to come along with him to Gwalior. Gujars are not Kshatriyas but farmers, so her first condition is to be treated with equal status and live in a separate complex, not with his other queens. This palace that the king constructs for his Gujar queen gets called as Gujari Mahal. 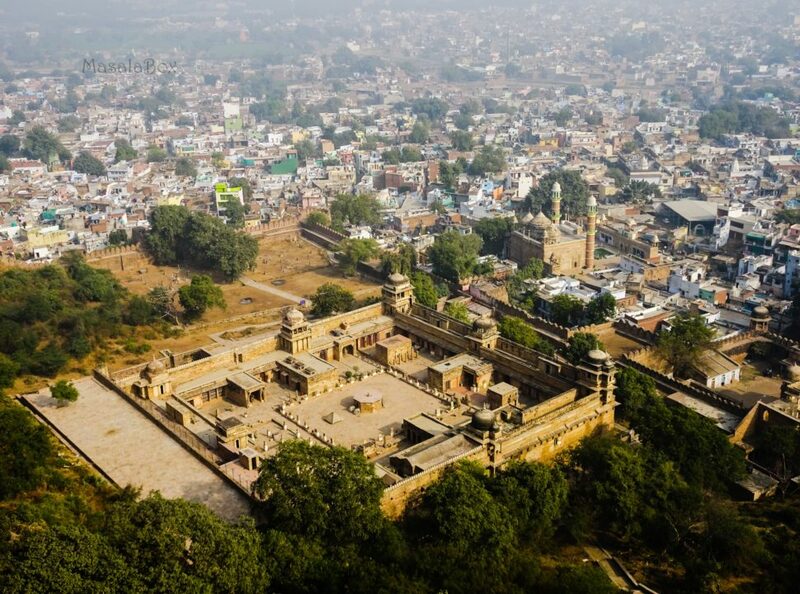 Gujari mahal can be seen from the Gwalior fort, it is in the town beneath the fort. Second is that she will accompany the king wherever he goes, that would be for hunting or to the court or to the battlefield. 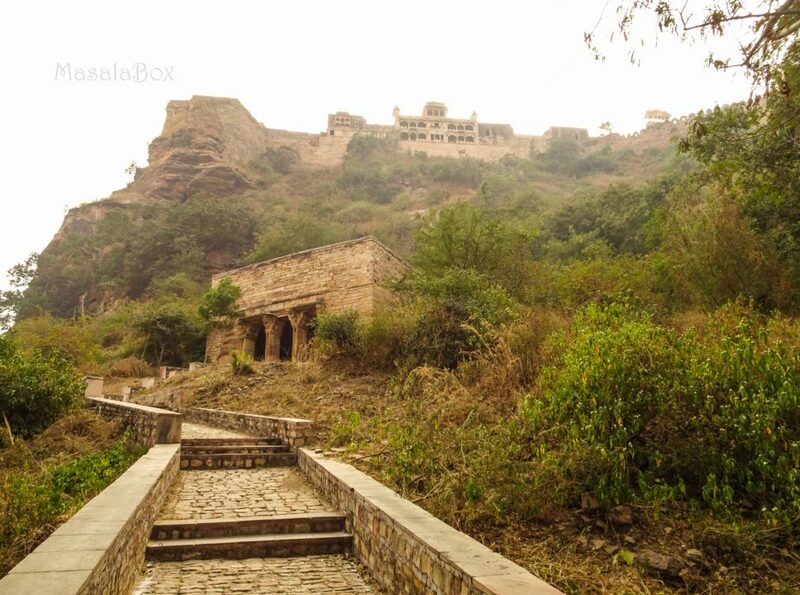 From the Gwalior Fort there is a separate path that leads to the Gujari Mahal. So every time he comes back to the fort or leaves the fort he uses this path, stops by the Mahal and then proceeds. 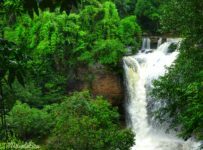 The third condition is she asks for water to be supplied from the river that runs through her village as she believes that attributes to her beauty and strength. The smitten Man Singh does that too. 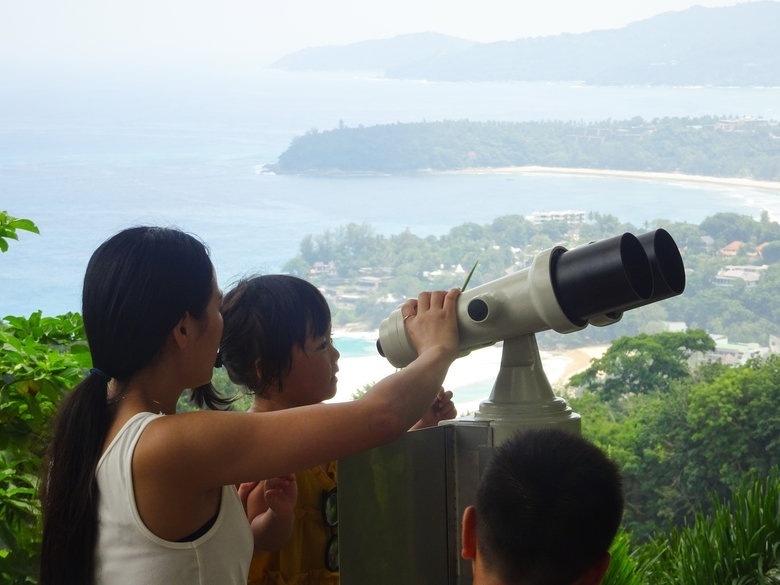 That is also one of the reasons cited to having the palace at a lower level and not inside the fort up the hill as it was difficult to construct ducts that could push the water up hill. And thus Rani Mrignayani and Raja Man Singh Tomar live in love with each other until the invaders attack and take over Gwalior. So it is a till death do us apart story. Today Gujari Mahal is an archaeological museum. 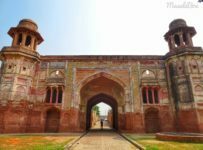 Wading through the narrow streets of Gwalior, the auto guy stopped in front of the gate of Mahal what appeared to be something like a place within the old town and people dwelling all around the mahal. Like Gwalior fort, the Gujarai mahal also still has those blue tiles intact making it look pretty! The museum was closed on the day I visited, however there were some artifacts placed within the complex that we were able to get a glimpse of. 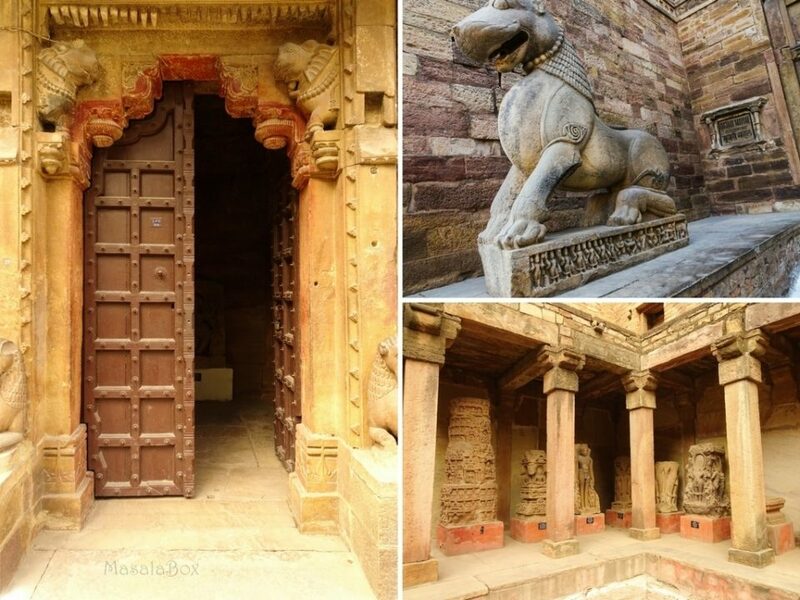 The next time you are visiting Gwalior, do plan to check out Gujari mahal as well apart from the Gwalior Fort. Gwalior has an airport. Connected well through Railways and bus as well. 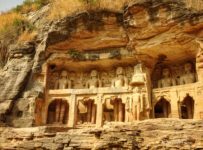 It is in the town as opposed to the Gwalior fort. Throughout Amritsar and Punjab you will be hearing a lot about Maharaja Ranjit Singh and his bravery. He is popularly known as “Sher-E-Punjab” which means Lion Of Punjab. He lost his vision in left eye due to small pox while he was just an infant. But by the age of 10 he was found fighting battles with his father and soon in his teens he became the king of Punjab. It is said that, he and his army were so powerful that the British or any other muslim invaders were not able to invade his territory at all until his death. He was the king who contributed to gold casting of the Golden Temple. While you get to hear a lot about bravery of Lion of Punjab, one can seldom hear about his love for Moran Sarkar and the now memorial Pul Kanjari aka Pul Moran. Not even my cab driver who was from Amritsar knew about Pul Moran and he was surprised to see where I had taken him. 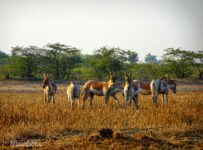 Close to the Attari Wagah border, while you will see thousands flocking to watch the Attari Wagah border ceremony, there will be none in sight at Pul Kanjari. When I walked through the gates of Pul Moran, it appeared to be a bare open mahal with just the walls remaining. 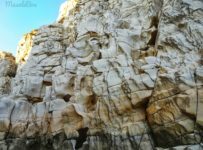 It is a place that was roughed up over time and I must say it has been maintained and restored well for what it has gone through. Maharaja Ranjit Singh had about twenty wives, some say more but among the many love stories he weaved, the one with Moran stands out. Maharaja Ranjit Singh often traveled between Lahore and Amritsar for trade and administration purposes. And on such journeys he would stop at his rest house constructed en route. 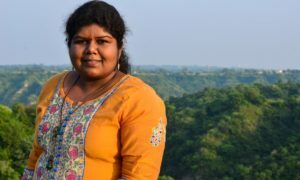 Moran Sarkar, a nautch girl (girl who dances for an audience like devadasi) from nearby village, would be summoned to dance in his court for him. Considered to be learned in arts and a wonderful dancer, Ranjit Singh soon fell for her. 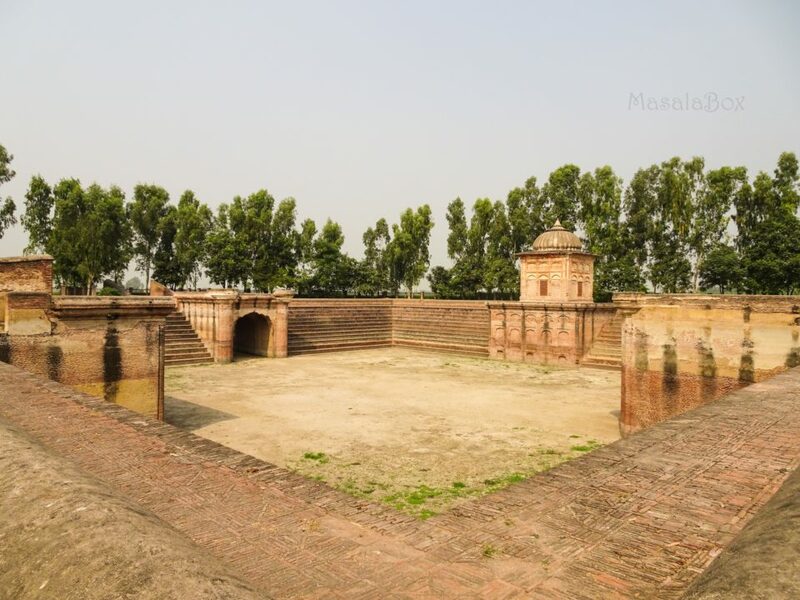 Once when Moran Sarkar was traveling to Ranjit Singh’s Baradari, she had to cross a canal. The water level was so high that a silver slipper from one of her legs gets washed away in spite of her riding on a horse. Moran arrives to the court disappointed, with one silver slipper, bare legs and refuses to dance in front of Ranjit Singh. Heartbroken Ranjit Singh then orders to build a bridge across the canal. Pul means bridge. 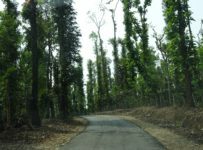 The place thus gets the name Pul Kanjari. Ranjit Singh then marries her and makes her his queen. However, Moran was a muslim girl from a lower caste which his other wives, his army and the whole of his territory finds it offensive. After the wedding, Akhal Takht the administrative office of the Golden Temple, Amritsar, issues punishment to him that he should be publicly flogged for marrying a girl who is not a Sikh. While the head of the Akhal Takht ties him to a tree and gets ready to thrash him with a whip, Ranjit Singh apologizes and the public accepts his apology! Sad that people could think of punishing someone for falling in love. Moran still remains his favorite wife. He issues coins with imprint of Queen Moran and even builds a mosque on her request. 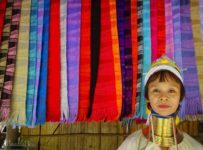 Originally known as Pul Kanjari, Kanjari means nautch girls which people felt derogatory and changed the name of the place to Pul Moran. The border with Pakistan runs close to Pul Moran and hence it had its effect during partition. People kind of left the place and only few few farmers around. Pakistan occupied Pul Kanjari during the war in 1965 and 71, the war had its effect too. A war memorial can also be found in Pul Kanjari. The Baradari had a surprise element too! 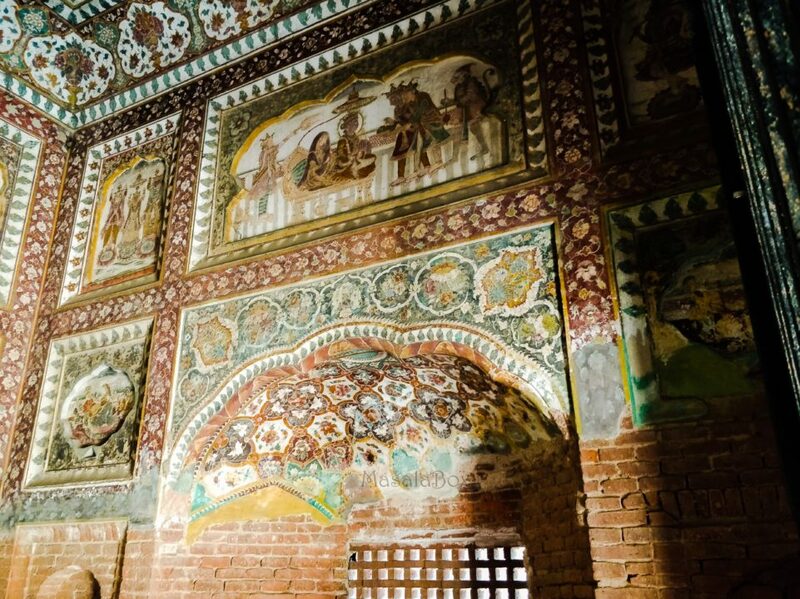 As I walked around the baradari, to the right side was a small room that appeared dark and locked from outside. Peeping in, I was taken aback with the colorful frescoes all around the walls from top to bottom. Thankfully this room had a grill preventing miscreants from damaging the paintings. 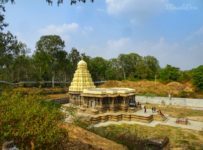 Apparently it is a Shiva temple. My pictures are not so good as it was tough to manage to take pictures past the grill door. This is one detour you must take and visit en route Attari Wagah border..
Amritsar has its own airport and well connected by train and bus. From Amritsar you will need a vehicle for yourself as I did not see any public transport heading here. Pair it with Attari Wagah border visit. From the terrace or upper floors of Jahangir Mahal of Orchha, one can see a mahal, not so big but still intact. That mahal holds the love story of Rai Praveen and Indrajit. 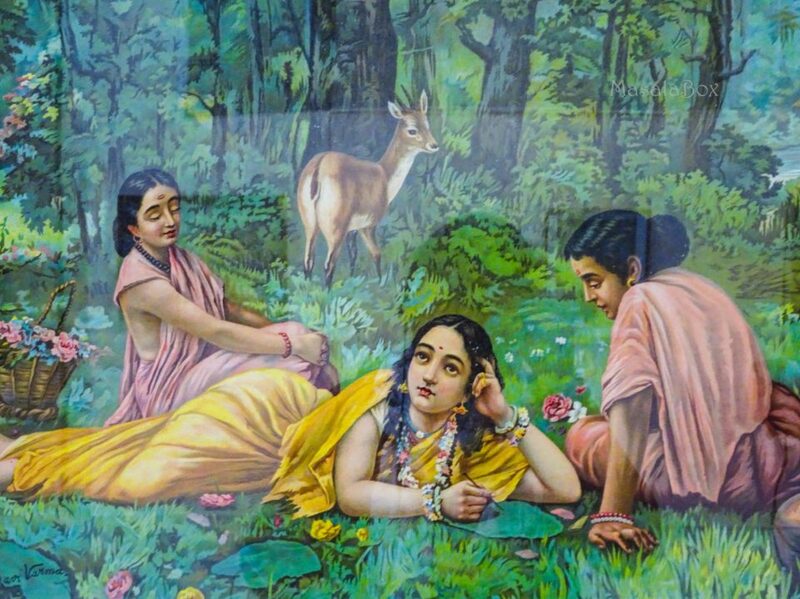 Rai Praveen, the nightingale of Orchha, was the favorite courtesan of Indrajit. She was an excellent dancer and was a very witty poet. The prince is smitten by the dancer and their love story is one of the strong love stories that is told time and again in Orchha. The beauty of Rai Praveen is so much talked about that Emperor Akbar summons her to his harem. Indrajit however, when he tries to resist Akbar’s wish, is forced to face Akbar’s army (all for a woman!). In order to avoid a war, Rai Praveen agrees to visit Akbar. The witty lady saves herself however! When she presents herself in front of Akbar, she recites a couplet, that goes, “Only a lowly person, scavanger, dog and crow eats from a plate partaken by someone else”. Akbar impressed with her wittiness and her faithfulness to Indrajit sends her back with gifts. Rai Praveen comes back to Orchha. Some give it a happy ending and conclude this love story as, Indrajit married Rai Praveen when she comes back. Some give it a tragic end where Rai Praveen was still not accepted by the royal family for marriage and frustrated she, immolates herself. Indrajit also commits suicide not able to accept the loss of his love. The romance affair between the prince and the courtesan leads to the building of Rai Praveen Mahal. 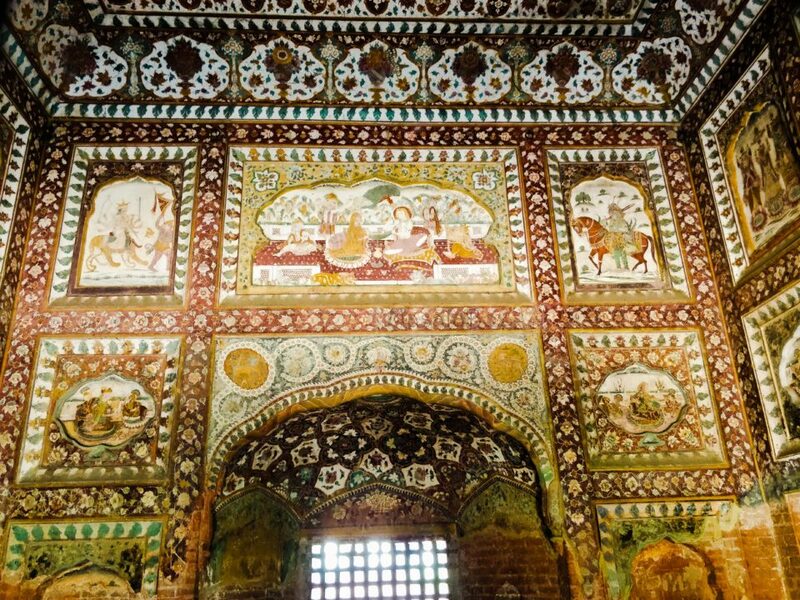 Rai Praveen Mahal has murals of the dancer, depressions on the wall which could have been embedded with mirrors or gems or candle holders. The Rai Praveen mahal is supposed to have garden in front of it, now there are just shrubs in front of it. 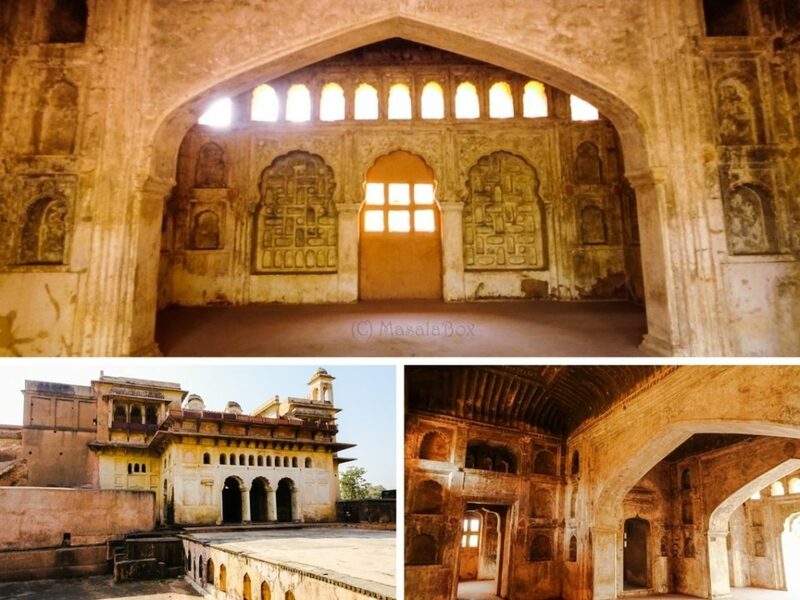 If you visit Orchha, walk behind the Jahangir mahal and visit the Rai Praveen Mahal as well. Khajuraho is the nearest airport. 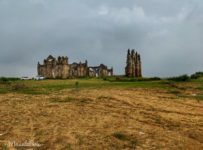 From there one can take Khajuraho – Jhansi express. Orchha has a small station and the train stops for about 2 or 3 mintutes. 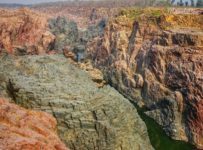 Else reach Jhansi and take a bus or vehicle from there. Baz Bahadur, one of the last Malwa sultans before the Malwa sultanate fell to the Mughals. 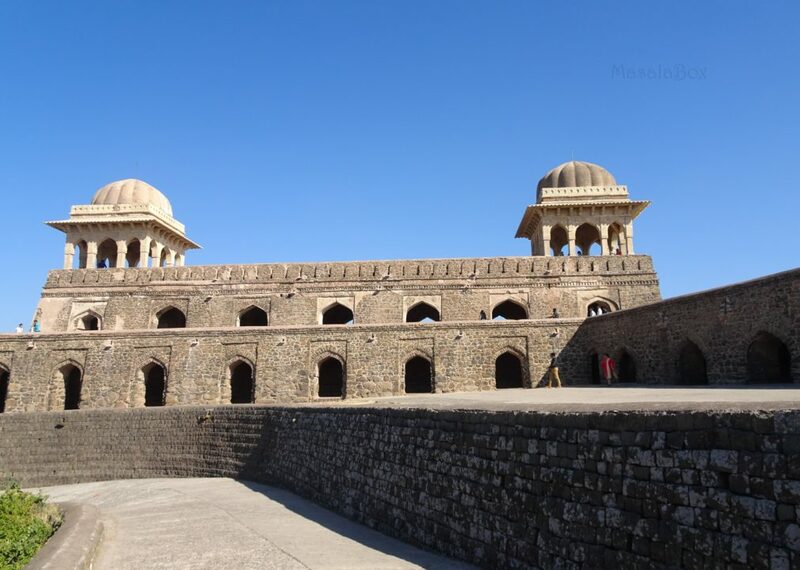 Mandu has a mix of palaces and forts of different architecture because of the various rulers it passed hands. However he was the man behind the many beautiful palaces built across Mandu. And known for his love story with Roopmati. Like the many love stories that we have seen so far, the sultan also met Roopamati when he was on a hunting expedition. He sees beautiful Roopmati, a shepherdess, singing along with her friends. Baz Bahadur immediately begs her to come along with him to Mandu. 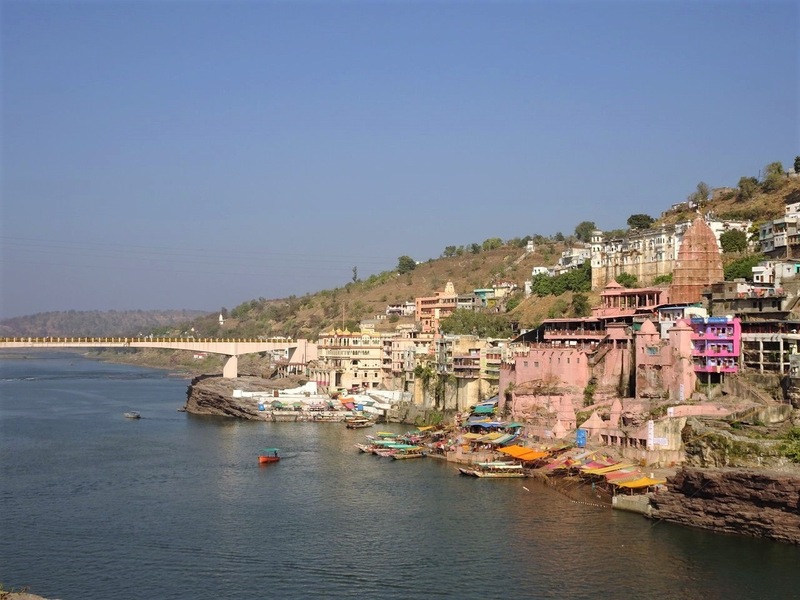 She agrees on the condition that if she can see and offer her prayers to River Narmada everyday she will come along with him to Mandu. He builds what is now called Rewa Kund where River Narmada gets collected. 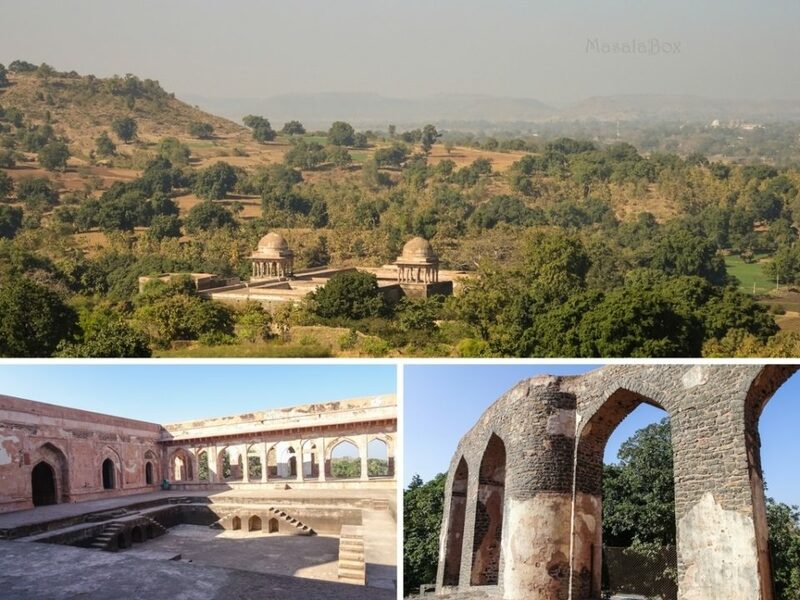 He also builds her a pavillion on the hill, so she can see Narmada from her palace. And from the pavillion she gets to see Baz Bahadur’s palace too. But the love story turns sour for the Malwa sultanate itself. Roopmati’s beauty, her penchant for music and poetry gets talked about far and wide. Akbar sends his general Adham Khan to capture Mandu and Baz Bahadur’s army was nothing in front of the Mughals. The army falls and Baz Bahadur flees seeking for help. It is said that Akbar sent his troops to capture Roopmati. And some say, Adham Khan was surprised by Roopmati’s beauty and decides to take her to Akbar! And she to keep up her honor consumes poison and gives away her life! Baz Bahadur comes back to see that there is no Roopmati any more and Mandu falls to Akbar, thus putting an end to Malwa sultanate. Indore is the closest airport. Mandu is connected by railways and bus. 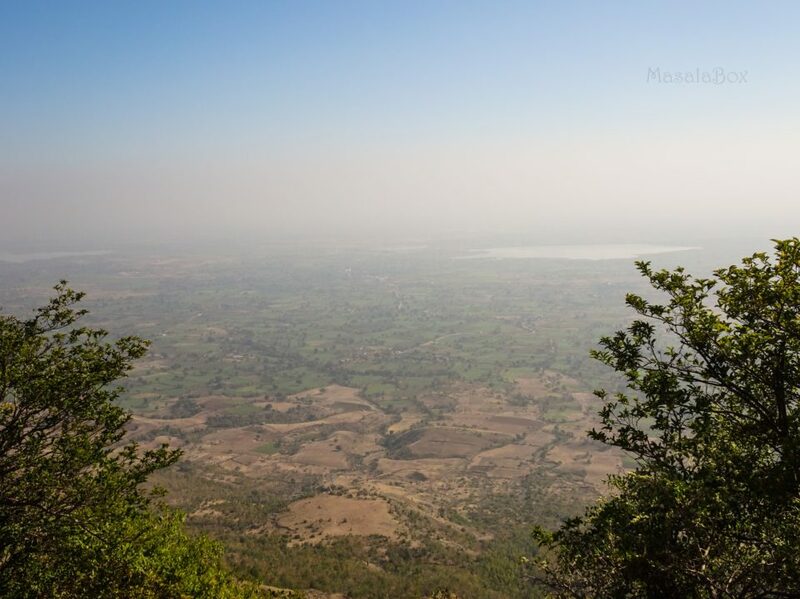 Sites between Mandu can be explored only if you have your own vehicle. They do not have autos plying between the different sites. One of the love stories that turned into famous bollywood movie and people know very well about, Bajirao and his love Mastani! This was a love story that rocked an existing love nest. Mastani is given in marriage to Bajirao for he helped in saving Chhatrasal’s kingdom. Mastani is born to a hindu rajput king and a persian muslim queen. Though she is a worshiper of lord Krishna, she is looked at as a muslim by the Marathas. Bajirao by family tradition remains monogamous until he meets Mastani, marries her and brings her to Saniwar Wada, his magnanimous house or palace. Mastani lives in one of the corners of the palace, there is a separate entrance for her to move in and out of palace called Mastani Darwaza. But Bajirao’s people in the palace kept growing intolerant and he built another palace for her to live at. This palace is no longer stands for public to see. There were many attempts to send Mastani on exile and sometime kept in house arrest by everyone from Bajirao’s family. Mainly because he was falling in love, Kashibai his first wife was neglected and Mastani’s influence was growing on him. Bajirao dies of illness in a battle and it is not sure if Mastani died immediately or a little later. 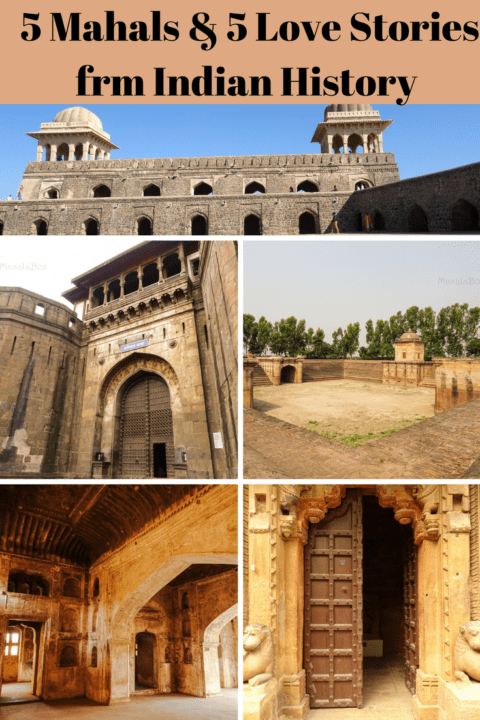 Shaniwar Wada on the other hand is more like a cursed place. 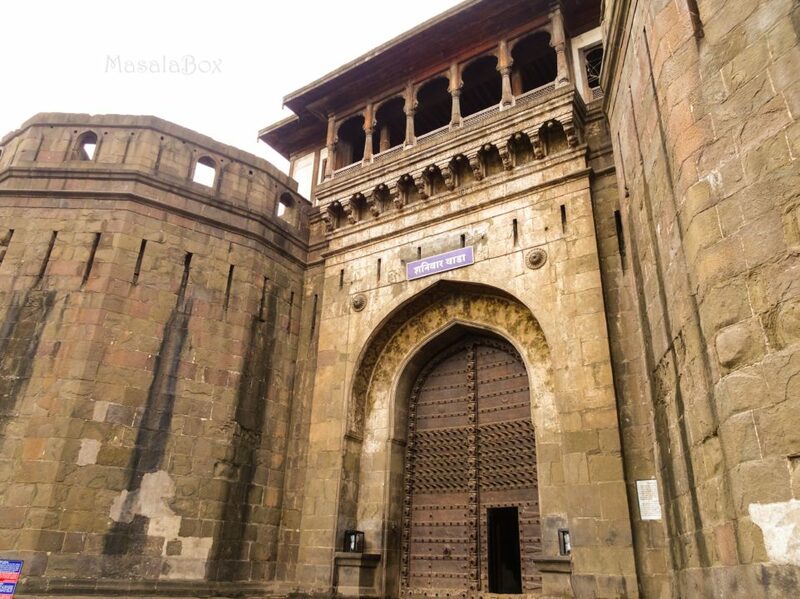 Unlike what you see in the movie and might have imagined what it ought to be, Shaniwar wada is now just the outer wall with the main might door entrance called Dilli darwaza intact. Everything else was burnt in a fire accident and now it is said that this place is haunted. 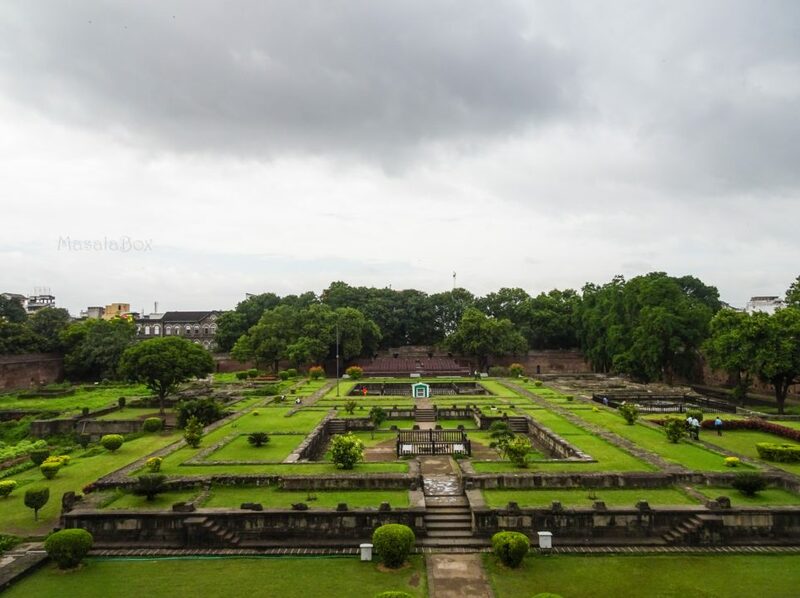 If you visit Shaniwar wada, you can see traces of what could have been a beautiful mahal with some great architecture..
Pune is a big city with airport, railways and bus stations, well connected. Plus you have uber, ola cabs to hire. The palace is right in the middle of the city. And that was your love stories from Indian history telling you tales of how you should fall head over heels in love that you forget the rest of the world. 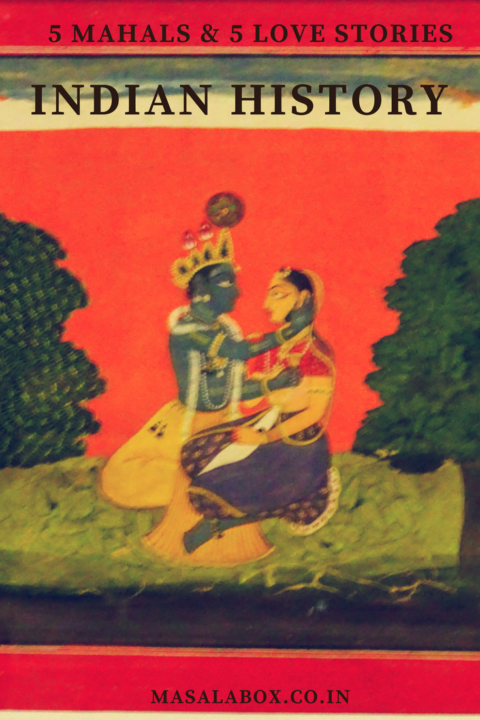 Love stories that kept caste, creed and race aside and stood against the society for their love. Love stories that make you the center of someone’s universe and takes you for a ride. And also wish you a happy Valentines day! 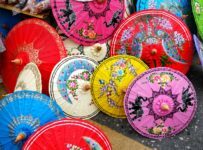 Great collection of stories and a really timely post! 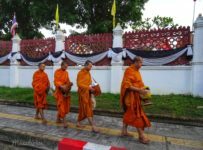 I visited Pul Kanjari but had no idea the temple nearby was open (could be opened!) Stunning paintings. 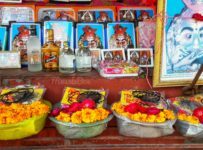 Thank you Shubham ☺️ the temple was locked.. managed to take few pics through the grill gate 😀.. slender phone helps..
Woow, a great post to read. Lovely work. 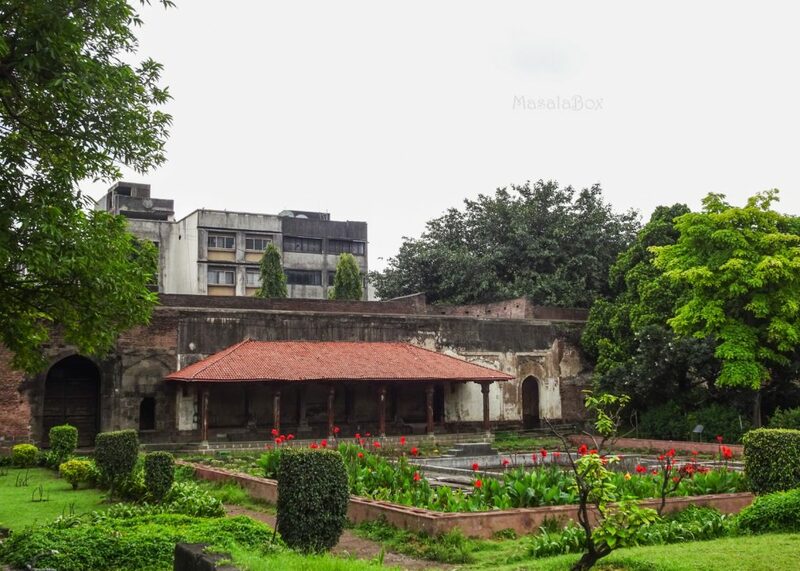 The plinths of buildings inside the Shaniwarwada can help you identify the 14 different structures that once formed a part of the retinue of the Peshwas who lived an worked here. 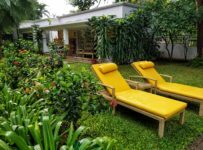 Fountains trees and shrubs help in identifying and giving a sense of history to the spaces that once were. Yes.. and thankfully they have marked it too, as what is what.